Sketched March 9, 8:28 p.m. 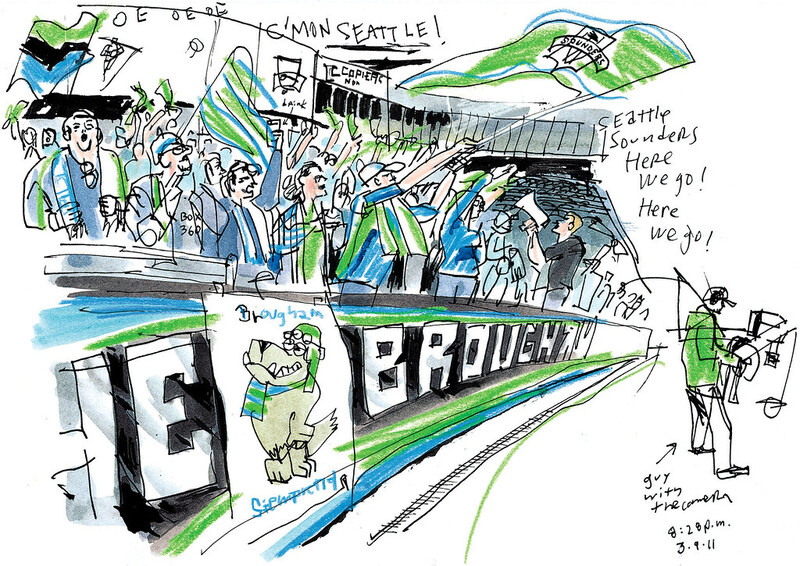 When the Sounders season kicks off Tuesday night against the LA Galaxy, Brougham End is the place to be at Qwest Field. I joined the frenzy here this week for a preseason game against Colorado, and the energy was already full-on, even though this was a friendly match. The Emerald City Supporters take the bleachers at the south end of the stadium and chant for the entire game’s 90 minutes. It’s a choreographed performance as riveting to watch as an actual game. They jump on the stands, raise their arms, wave flags and scarves, and sing their hearts out for the Sounders. On Tuesday night, I, too, will be drinking to a Sounders victory. 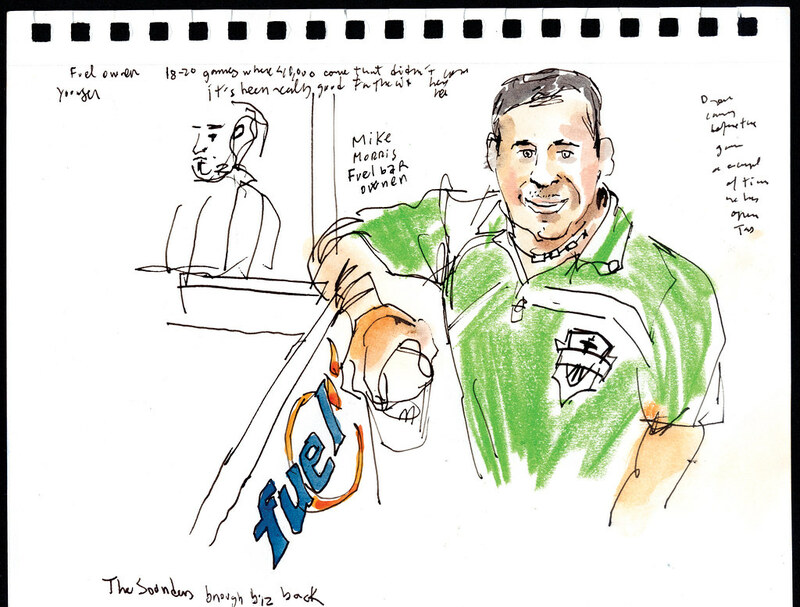 Before every game, expect a friendly crowd of ECS members at Fuel sports bar in Pioneer Square. Owner Mike Morris said the soccer matches bring more than 40,000 people to the neighborhood who didn’t come here before. The Sounders have been really good for the city, he said. 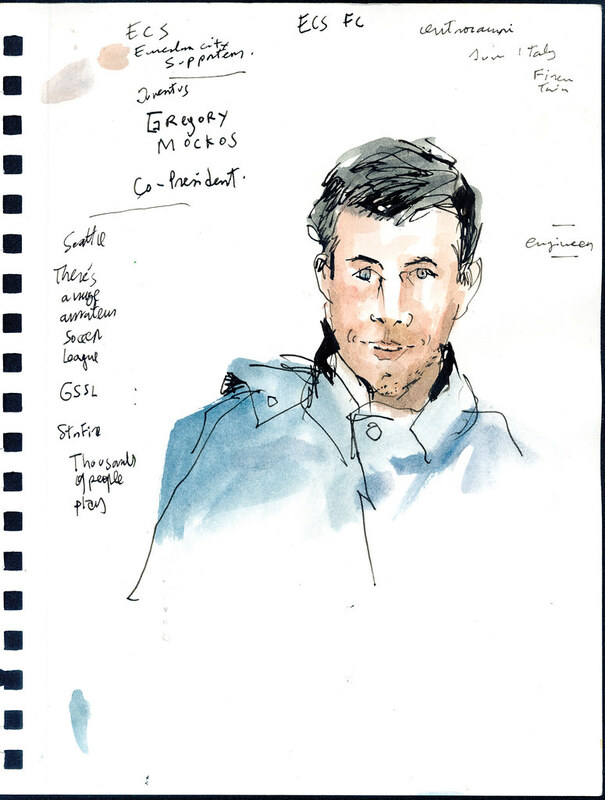 Italian-born Gregory Mockos, a civil engineer by day, is co-president of the Emerald City Supporters. He’s lived in Seattle since the year 2000 and attributes the success of soccer here to the great number of people who play the sport in amateur leagues like GSSL. “There are thousands of people who play,” said Mockos, including himself. Like Mockos, Robert Logue also likes to play soccer. An army soldier with the Fort-Lewis Stryker Brigade, Logue recalled playing soccer with Iraqi army soldiers during his deployments. “The Iraqis were really good,” he said. 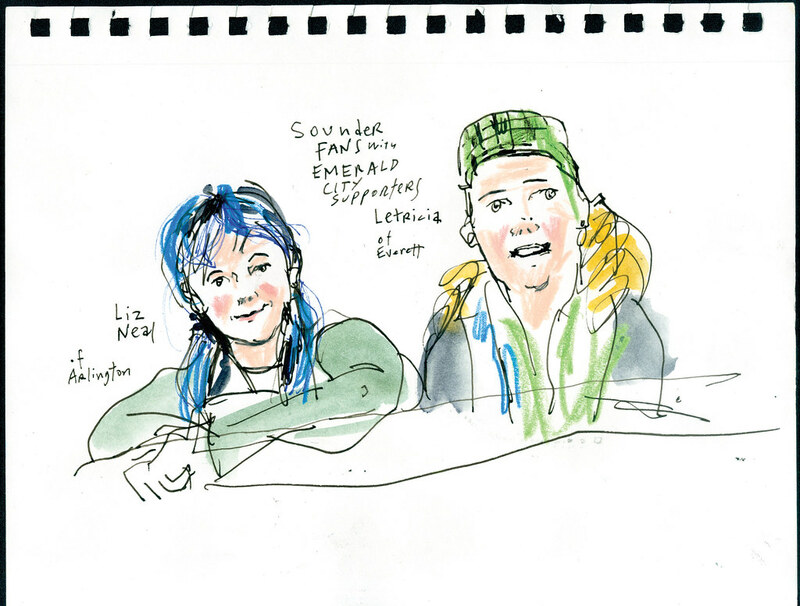 I had to wrap up talking and sketching at Fuel because the march to Qwest Field was about to start. I tried to make some marks on my sketchbook as I walked next to the group. Cheering fans clapped, made the sign of the horns with their hands and sang following directions from “il capo,” who held a megaphone and had to walk backwards at times to face the cheering group. This European-style chanting always makes me feel as if I was in my soccer-crazy hometown of Barcelona. 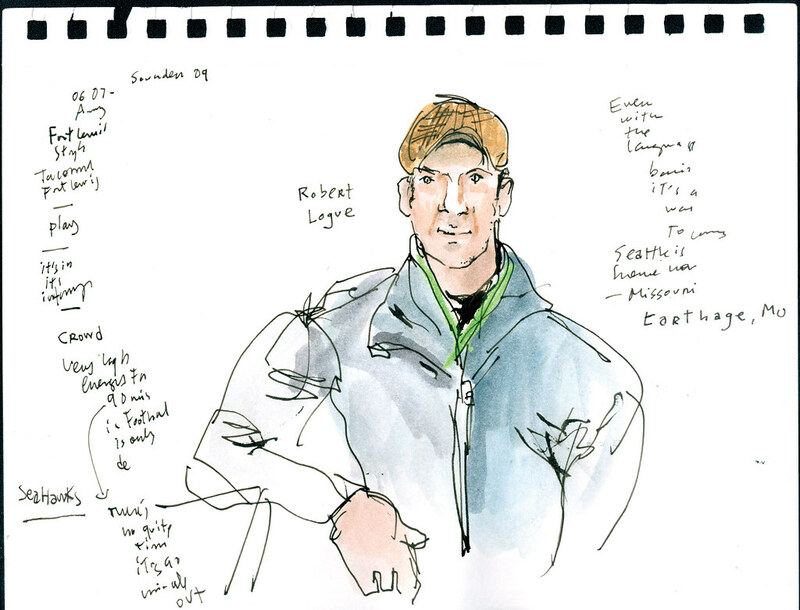 Once in the field, the first spectator I approached with my sketchbook was Aaron Hogue of Poulsbo. 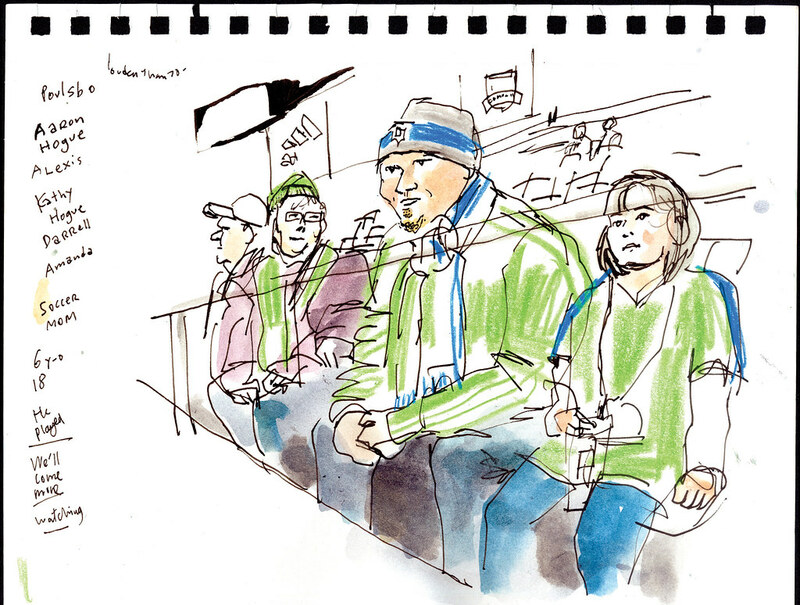 He had brought pretty much his entire family to the game –not everyone is shown in the sketch. He also played the sport growing up. “Since he was 6-years-old until he was 18,” said his proud soccer mom sitting next to him. Letricia Johnson and Liz Neal were on first row at Brougham End. Johnson said the more combinations of blue and green you can wear to the game, the better. For Neal, that meant sporting a blue wig. Johnson had a cool hat with a green and black checkered pattern. 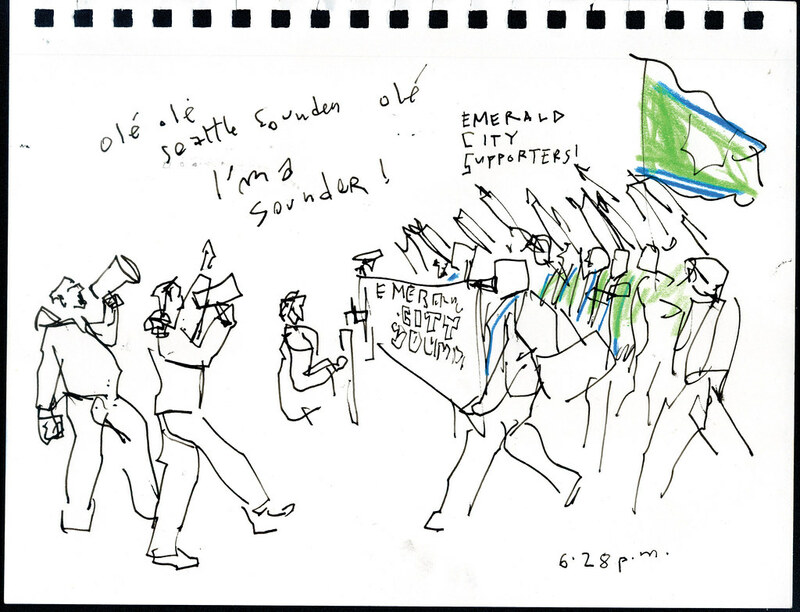 Find out more about the Emerald City Supporters at www.weareecs.com. They have videos of their songs and a downloadable song sheet pdf that I’ll be bringing with me the next time. Go Sounders!